Put a stop to these. If you don't, they might derail your program. In the world of personal protective equipment, bad assumptions are hazardous and often injurious. Unfortunately, despite 25 years of solid regulation, some persistent bad assumptions are very widespread in Hearing Conservation Programs (HCPs). Here are five of the most common bad assumptions about hearing protection for noise-exposed workers. Perpetuated unchecked, these assumptions torpedo an otherwise healthy Hearing Conservation Program and leave the door open for hearing loss among workers exposed to hazardous noise. Assuming that proper use of hearing protection is fairly intuitive (“just put it in your ear . . . .”), many safety managers provide little or no training in how to use protection properly. Or they generously assume that workers will read the manufacturer’s instructions on the packaging. A comprehensive study of HCPs in the United Kingdom revealed that when hearing conservation training had been provided by posters or leaflets, fewer than half of the “trained” workers could recall the content.2 But repeated studies show that the most effective use of hearing protection comes after one-on-one training. Large group training in hearing protection seems to have little effect on proper usage; only individual training can be linked to high attenuation results. For proper fit of ear plugs, the fitting steps are not complicated. A simple, three step process conveys the essence of a proper fit for foam ear plugs: Roll, Pull, Hold. Roll down a foam ear plug into a small, crease-free cylinder, pull the outer ear up and back to open the ear canal, insert the ear plug, and hold in place while it expands. The Roll/Pull/Hold mnemonic is illustrated in a NIOSH Web site3 that includes graphics as well as a downloadable video you can use in your own training program. For proper fit of ear muffs, move aside any thick hair and seat the ear muff so that it encloses the entire ear. Avoid safety glasses with thick temple bars at the frames because they create gaps in the seal that reduce attenuation by 5-10 dB for many ear muffs (see “Earmuffs & Safety Eyewear,”4 a technical bulletin posted on the Howard Leight Web site). Assumption 2: Any ear plug in the ear is blocking some noise. It simply isn’t true. An ear plug just sitting in the bowl of the outer ear, without sealing the ear canal, is simply nice ear décor—it is offering little protection from noise. In fact, attenuation measurements show that a poorly fit ear plug often creates a resonance cavity in the ear canal that actually increases the noise level by a few decibels (similar to cupping your hand around your ear to hear better). This is problematic for a safety manager who is trying to judge compliance visually. He/she might assume that any ear plug that can be seen in a worker’s ear must be doing some good, then focus more on the workers who are wearing no protection at all. In reality, ear plugs that can be seen (from the front) are poorly fit and offer little protection, just like the worker with no ear plug. Here is one visual cue of a proper ear plug fit: When viewing yourself in a mirror straight ahead (or when looking at a coworker face-to-face), a poorly fit ear plug is clearly visible protruding from the ear canal, while a properly fit ear plug is hardly visible. For the user, a good self-test of proper fit of ear plugs is easily performed. 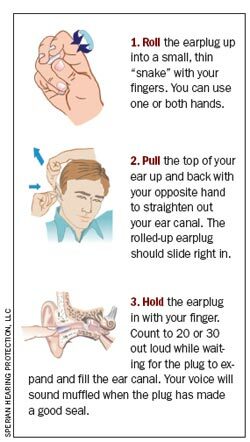 Prior to inserting your ear plugs, press the palms of your hands tightly against your ears and say some words out loud. Your own voice sounds louder and deeper when your ears are covered. Now, insert your ear plugs and repeat that voice check. If the ear plugs are properly fit, there will be very little difference in the sound of your voice when you cover and uncover your ears with your hands. Assumption 3: An ear plug halfway in the ear blocks about half the noise. It seems plausible that if a well-fit ear plug blocks 30 dB of noise, then a half-fit ear plug must block 15 dB of noise. Unfortunately, the math of hearing protection does not work that way. Instead, a half-fit ear plug is often providing 0 dB of attenuation. Workers in noise levels of 85-95 dB (close to the OSHA Permissible Exposure Limit of 90 dB time-weighted average) are routinely offered ear plugs with Noise Reduction Ratings of 30 dB or more. When worn properly, that 30 dB hearing protector can make the worker feel isolated—unable to hear warning signals, co-workers, machine maintenance sounds, or communication radios. To hear critical sounds, workers will sometimes remove their ear plugs about halfway, assuming they are still adequately protected. But in noise attenuation,any small channel or leak allows the noise to enter, and the protection quickly deteriorates from “all” to “none. ”How do we protect a worker who does not need 30 dB of protection? Use hearing protectors with lower Noise Reduction Ratings. When used properly, a lower-attenuating ear plug will provide protection without sacrificing communication ability. Assumption 4: Cut the NRR in half to predict real world protection. Since the EPA promulgated its Noise Reduction Rating (NRR) on all hearing protector packaging in 1974, many studies have shown that attenuation achieved in the real world is sometimes far below the laboratory NRR. There are a number of good reasons for this difference: Users in the real world might not receive proper training or might adjust their hearing protectors for comfort rather than protection, or they may intentionally compromise the fit in order to hear co-workers and machine noises more clearly. A 50 percent de-rating method, defined by OSHA to determine feasibility of engineering controls, is often misapplied to try to predict real-world protection for workers in a Hearing Conservation Program. Such derating is arbitrary and usually wrong! Using a fit-testing system for ear plugs, the Howard Leight Acoustical Laboratory visited eight industrial sites and measured real-world attenuation of 100 workers using ear plugs from a variety of manufacturers. Workers were instructed to fit their ear plugs just the same as they usually do. A Personal Attenuation Rating (PAR) was then measured on each ear. The PAR results showed that one-third of the workers achieved attenuation slightly higher than the published NRR, one-third of workers showed attenuation within 5 dB below the published NRR, and about one-third showed significantly lower attenuation (anywhere from 0 to 25 dB). Recognizing this disparity between real world and laboratory results, EPA has announced its intention to update the NRR this year. Instead of a single-number attenuation rating (31 dB, for example), the new NRR label will likely show a range of measured attenuation for a given ear plug (18-29 dB, for example). The lower number indicates the expected attenuation for groups of workers with little or no training, while the higher number represents the expected attenuation for groups of workers with some individual training in hearing protector fitting. Most experts agree the new NRR range will provide a more realistic indicator to safety managers of how hearing protectors operate in the real world, but the new NRR still will not predict exactly how much protection an individual worker achieves. That would require individual fit testing, described below. Assumption 5: There’s no way to measure real attenuation on a worker wearing ear plugs. There definitely are several methods of measuring real-world attenuation on workers wearing ear plugs.5 Instead of relying upon the population estimates of the NRR, a safety manager can now measure each worker’s protection level. While each method of fit testing has its own merits, they can be divided into two categories: objective microphone fit testing (no cooperation required from user, but a specially prepared ear plug with a probe microphone through it must be used) or subjective real ear testing (responses required from a cooperative user, but this method can be used with any ear plug from any manufacturer). Using a fit test to verify attenuation, a safety manager can document exactly how much protection a worker receives with a given ear plug. The result is a Personal Attenuation Rating (PAR). But that PAR is specific only to that ear plug, that worker, and that particular fit. Fit testing might not be feasible for some employers to administer on every noise-exposed worker in the facility, but it is certainly feasible for new hires or workers demonstrating a significant threshold shift in their audiometric testing. 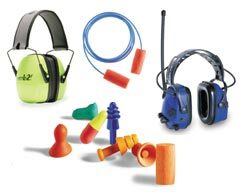 OSHA regulations require these workers be retrained and refit with appropriate hearing protection, and the fit test systems available now allow employers to accomplish that very effectively. Bad assumptions sink many well-intentioned safety initiatives. But avoiding these simple bad assumptions about hearing protection helps a Hearing Conservation Program stay on solid ground and do just what it is designed to do: prevent noise-induced hearing loss.